Who knew making bread was so incredibly easy? And fun? 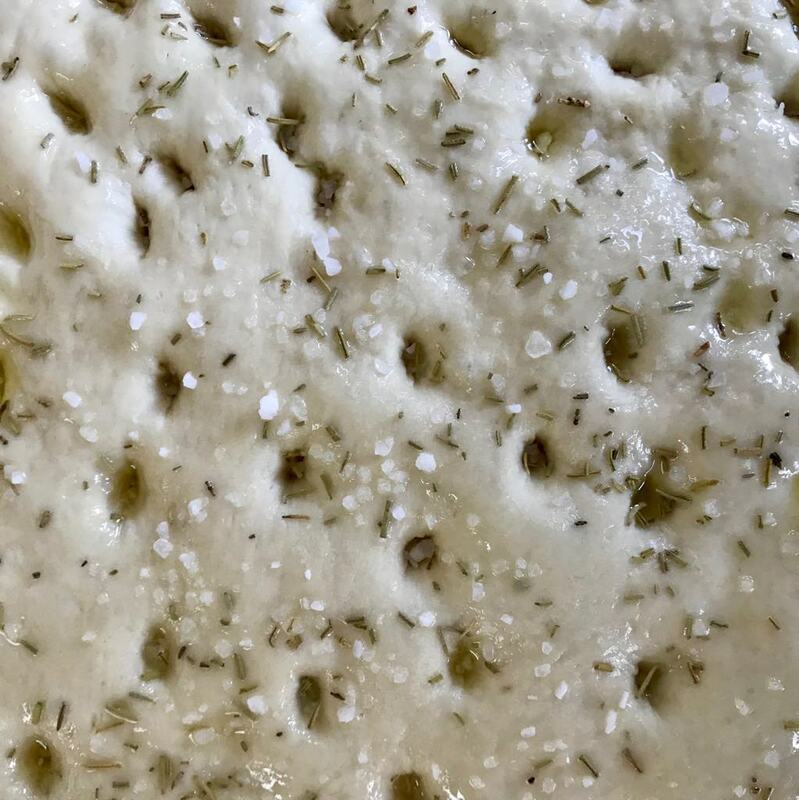 You definitely don’t need any fancy equipment to make this delicious foccacia and even better, you only need FIVE ingredients! It takes a while to make, just because you have to let the dough rise, but it doesn’t require you to be constantly in the kitchen. This is a great recipe for beginner bread makers. 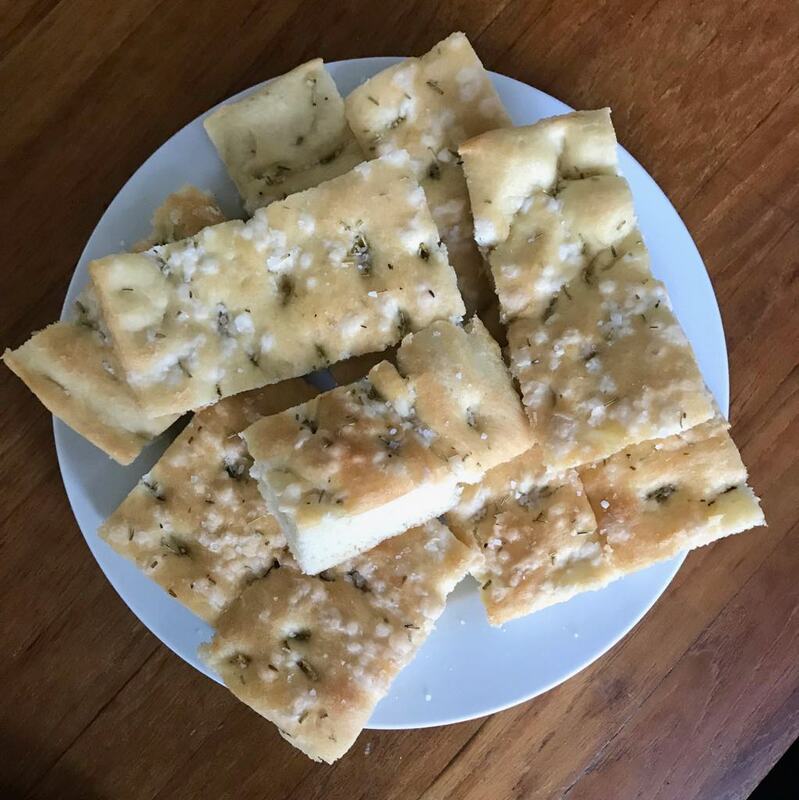 You can take this simple foccacia and build on it to create your own flavours. It is also an easy recipe to play around with; if you make a thicker dough you could cut it open and make a sandwich out of it, alternatively keep it thin and let it go nice and crispy. Add everything but the water into a large bowl and mix together. Add half the water. Keep adding the water slowly and mix, stopping when the dough forms a shaggy ball. Move the dough to a lightly floured surface and knead using your fists. Keep going until the dough is smooth – this will probably take about 5 minutes. Add 2 T oil to the bowl and roll the dough around the bowl so that the bowl and the dough are all lightly oiled. Cover the bowl and leave to rise in a warm spot. I cover mine in glad-wrap, topped with a kitchen towel and ideally will put it in a sunny spot outside. Leave the dough to double in size – this will take about an hour and a half. The dough should become cloudy and soft. Grease an oven tray and spread the dough flat across the tray. Cover with a towel and leave it to rise for another half an hour. Using your fingers, dimple the dough so that there are small holes covering the surface of the day. In my opinion, the more the better; they help the dough go nice and crispy! Drizzle olive oil over the top (angling the tray so that the oil can spread into the dimples). Sprinkle a generous amount of coarse sea salt and rosemary (or any other topping) and leave to sit for another 15 minutes, while the oven heats up to 200°C.